View of “Arakawa and Madeline Gins: Eternal Gradient,” 2018. Gins and Arakawa’s exhibition here displays the couple’s production at the very moment they began to translate their philosophy of “reversible destiny” into spatial design. One series of never-before-exhibited drawings, “Screen-Valves,” 1985–87, studies for an impossible-looking geometric enclosure, suggest an iterative process of developing a visual vocabulary feasible in three dimensions. Other sketches, such as Drawing for Ubiquitous Site X, 1990, are halfway between surrealist composition and blueprint. 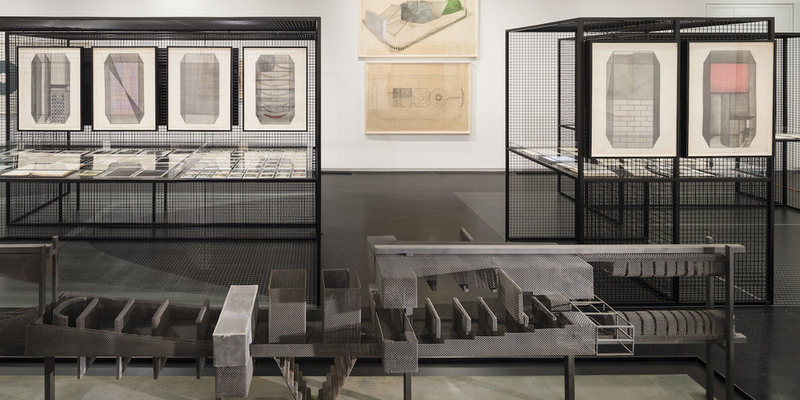 Artifacts from their archive—unpublished manuscripts, correspondence, Polaroids—are arranged and framed within a gridded metal structure by design firm Norman Kelley. The smart exhibition architecture references both the drawings and an exquisite wire model for an unrealized project titled The Process in Question/Bridge of Reversible Destiny, 1987–90. Although they did not, ultimately, live forever—Arakawa died in 2010 and Gins in 2014—their proposal for an architecture of immortality was, at heart, a confrontation with foregone conclusions about what a life should be. “Eternal Gradient” offers an (oddly shaped) window into a practice ready to be revivified.